In humans, malignant melanoma is the deadliest form of skin cancer, but can dogs get melanoma? The unfortunate answer is yes — however, just like with humans, there are varying types of melanoma that affect different parts of a dog’s body. Some variations are more serious than others. But with any type of cancer, an early diagnosis is key to catching this potential killer before it’s too late. While ultraviolet light is a major cause of human melanomas, this doesn’t appear to be as much of a factor with the canine form of this cancer. However, no one knows the exact cause of melanoma in dogs. Researchers believe that it could be due to a combination of genetics and environmental factors. Melanomas are categorized as either benign or malignant. Benign melanomas, also called melanocytomas, are typically harmless with a very low risk of spreading, or metastasizing, to other parts of the body. Malignant melanomas, however, can metastasize very quickly, spreading to other parts of a dog’s body, particularly the lungs, liver and lymph nodes. For this reason, malignant melanomas present a dire health risk. 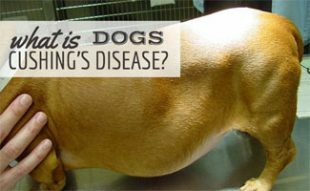 One of the scariest aspects of malignant melanomas is that dogs usually show subtle to no symptoms of being sick until the disease has spread to other areas of their body. Although most skin and eye melanomas in dogs are benign, it’s always a good idea to play it safe. If you notice an unusual lump or discolored area on any part of your pup, contact your veterinarian. Tip: You should also be concerned if any changes occur in the size, shape, color or ulceration of any growth or lump. The AKC recommends familiarizing yourself with all your dog’s natural lumps, bumps and rashes when they’re young and healthy, so you’ll know when changes occur. 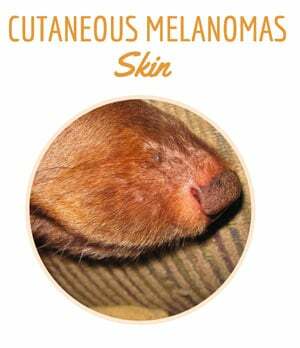 Most cutaneous melanomas are benign in dogs (in contrast to humans). But it can be difficult to distinguish between benign and malignant melanomas on your dog’s skin unless you’re an expert. 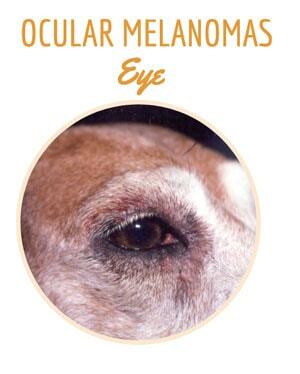 Melanomas in or around a dog’s eyes are almost always benign and rarely metastasize. But they can impair your dog’s vision and cause discomfort. 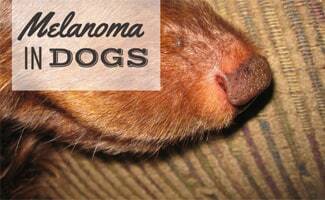 Oral melanoma accounts for 80% to 85% of all melanomas in dogs. 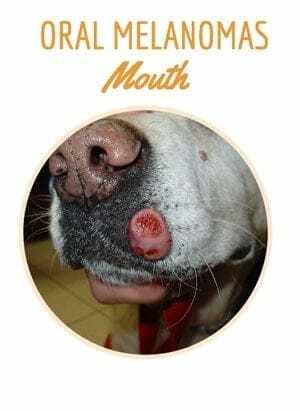 Malignant oral melanomas can infiltrate deep into the bone, and they metastasize in up to 80% of dogs. Melanomas in your dog’s nail bed are the second most common location (behind the mouth) and account for roughly 15% to 20% of all melanomas. Metastatic rates are dismally high at 80%, similar to the oral form of the disease. Subungual, or nail bed, malignant melanomas typically first appear as toe swelling and can even cause the loss of the toenail. These types of nail and foot-related tumors often develop a secondary infection, which can lead to a misdiagnosis. In the case of oral melanomas, if a tumor has spread to local lymph nodes, you may notice swelling under either side of the lower jaw (submandibular lymph nodes) or in front of the shoulders (prescapular lymph nodes). If you suspect there may be an issue, promptly schedule a vet appointment. Some melanomas can be diagnosed with a fine needle aspiration, a procedure in which your vet inserts a needle into the tumor or lesion and draws out some cells. This may require sedation. Sometimes a biopsy is required. Your vet will remove a small piece of tissue and send it to the laboratory for a pathologist to determine a definitive diagnosis. Biopsies require anesthesia. Biopsy results can also tell your vet if the melanoma may spread to other organs. 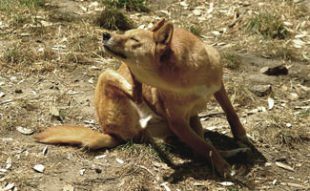 Treatments for canine melanoma depend on the tumor’s location and how much the cancer has spread. Surgical removal is usually the first step for both benign and malignant melanomas. Often, benign lesions are removed to reduce discomfort and avoid the chance of them becoming malignant. A pathologist will examine the removed mass to determine if and how the cells have spread. Malignant melanomas require surgical removal of the mass, surrounding tissue and affected bone. In the case of oral melanomas, part of the dog’s jaw may need to be removed. And subungual melanoma may require amputation of the toe. Fortunately, reconstructive surgery can help to rebuild these areas. If the cancerous cells have spread or couldn’t entirely be removed, your vet will likely use radiation therapy, which results in remission in 70% of cases. Your vet could also opt for chemotherapy in conjunction with surgery and radiation therapy. Chemotherapy as a replacement for surgery and radiation has not proven to be a successful treatment for malignant melanomas. The USDA conditionally approved the Merial melanoma vaccine for dogs in 2007, but the research is still ongoing about its efficacy. The hope for this vaccine is that it causes the immune system to attack cancerous cells and prolong overall survival times. All of the national pet insurance companies offer some cancer coverage so be sure to check with them before you start down any given path to see if you could save some money on treatment. However, if you do not already have an active policy with a carrier, a cancer diagnosis is not the best time to sign up because pre-existing conditions are not covered. How long can dogs live with melanoma? It depends on many factors. Dogs with surgically removed benign tumors have an overall excellent prognosis. The life expectancy for dogs with malignant melanomas depends on the location and when the disease was diagnosed and treated. Like with human cancers, veterinarians base this on stages of the cancer’s progression, e.g., Stage 1-4 cancer. For survival rates, we’re focusing on oral melanomas, since they account for 80-85% of all canine melanomas. In general, the smaller the tumor and the closer it is to the front of the mouth, the better the prognosis. Which Breeds Are At A Higher Risk? Most common in dogs 9 years and older, melanoma can strike any dog breed, although generally small breeds are more at risk. 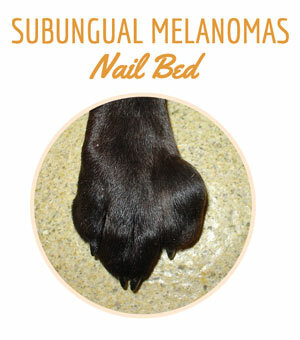 Malignant melanomas are also more likely to appear in the toes or toenail bed of black dogs. When pet parent Jamie noticed a blood blister on the top of her dog’s tooth, she was a little worried. Guinness, the family’s 6-1/2-year-old Bernese Mountain Dog, had a few other bumps on his gums, so she contacted her vet. “The flesh colored lumps were not that worrisome BUT a separate, raised, black bump on his upper lip was a more major concern and should be removed,” says Jamie. The bump was a sign of melanoma (a diagnosis would come later). At the time, the vet didn’t mention melanoma, so they booked the next available surgery: three weeks out. “Now, knowing what that black bump was, I wish we had demanded an earlier surgery. Also, with hindsight and a full reflection of the signs and symptoms of melanoma, we could see an increase in bad breath, extra saliva and smacking of his lips were additional indicators of what was to come,” Jamie says. Guinness’s surgery was a success. A few days later, though, Jamie was called with a diagnosis: it was oral melanoma. The vet advised to “wait and see,” however Jamie was instantly on the phone with a veterinary oncologist, scheduling an appointment for the very next morning. At the appointment the next day, Guinness had some ultrasounds and x-rays, and Jamie received good news: the cancer had not yet spread, and he was diagnosed as Stage 1. They scheduled his second surgery to gain wider clean margins (where no cancer cells are seen at the outer edge of the tissue that was removed), and Guinness was not recommended for radiation. Rather, they began immunotherapy in the form of the oral melanoma vaccine. “This is a procedure that occurs every two weeks for the first four series and then again twice a year for the rest of his life,” explains Jamie. So far, since his diagnosis in November 2018, Guinness’s vet bills have totaled $11,263, and Jamie has been reimbursed $9,696 (90% reimbursement rate and $500 deductible). “At each and every step and decision, I was advised of the best case option but then asked to review medical invoicing estimates before any of those steps could be scheduled,” says Jamie. Luckily, she never once had to look at the bottom line when determining what the best course of action was for Guinness and her family because she had pet insurance. A cancer diagnosis and treatment is one of the most costly situations you’ll have to face as a pet parent, both in terms of the emotional toll and financial obligations. If you fear your dog may develop cancer (or another serious illness) one day and you don’t want to have to decide between your wallet and treating your furry friend, investing in pet insurance is a wise option. As long as you have pet insurance in place before your dog becomes sick, many of the best pet insurance carriers will cover a portion of the thousands to tens of thousands of dollars for expensive surgery, radiation and other treatments. 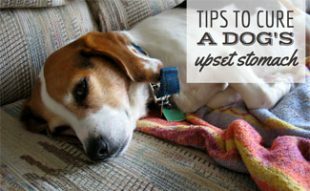 This way you can focus on getting your pup healthy without worrying about how you’re going to pay for their care. 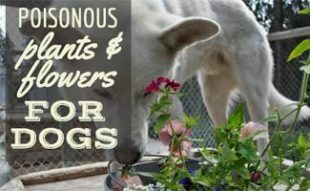 Have you ever had to face dog cancer before?